The trends of sustainability in our built environment are ever-increasing. Innovations and technological development are allowing us to achieve a more restorative infrastructure than ever before. As these pioneering technologies continue to enter the mainstream markets it seems inevitable that we begin to work together. Building professionals are creating better facilities through the holistic approach inherent in the green building movement. The next step on the green building path is to combine the growing number of incredible products designed with environment, community and economy in mind. WholeTrees sees this opportunity in solar carport structures. WholeTrees initially teamed up with fellow B-Corp, SunCommon Solar out of Vermont to develop this new product. We worked with their team to understand the needs of the system and their clients. We all agreed, it seems counterproductive to support clean energy PV panels with high embodied-energy structure materials like steel and concrete. If our goal is to make a better decision by choosing less depletive energy sources, don’t we want to extend that decision by choosing restorative structures? The story of every one of our products begins in the forest. Currently, a vast majority of our woodlands are undermanaged, overstocked and suppressed requiring culling or weeding to restore and revitalize their health. Unfortunately due to suppressed pulp prices, these cull trees are losing value reducing incentive to implement management practices. WholeTrees is working to propel this low-value waste stream into high-value structural markets to retain the awe and delight of our forests, limit forest fires, and deter redevelopment. Black locust is a highly invasive species that is abundant across the country. As it takes over it chokes out native deciduous species causing forest health to decline and due to lack of markets its mitigation remains minimal. Black locust is incredibly strong, but quite brittle making it difficult to mill, but what doesn’t work for the conventional lumber industry works wonderfully for WholeTrees. Black locust is a perfect species for our round timber carports due to its natural decay and rot-resistant qualities. We list a 50 year lifespan with studies showing black locust posts directly in the ground not showing rot for over 100 years. The WholeTrees product manufacturing process is a holistic one. We follow the tree directly from the forest all the way through to construction creating a transparent and responsible supply chain. 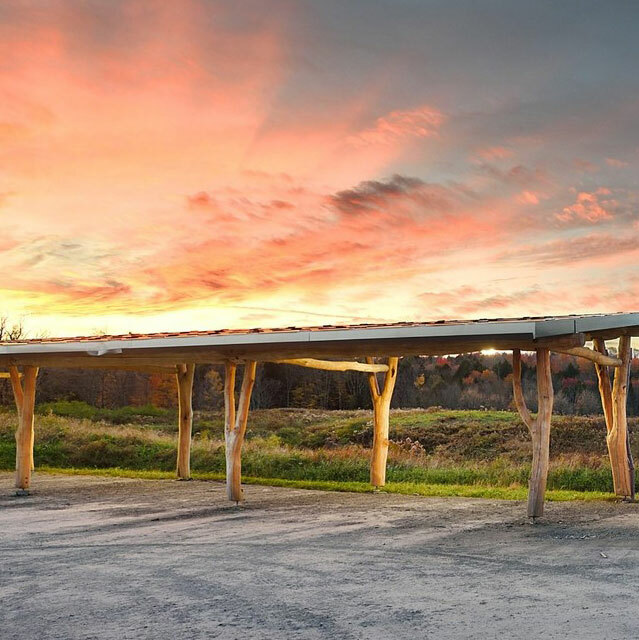 The solar carport begins with selecting Black locust beams and columns to spec, working closely with the Wisconsin DNR to remove these invasive trees and bring them to this high-value market. Our trees can be FSC-certified upon request and always live up to the standard, while supporting economic growth in Wisconsin’s rural forest communities. The selected timbers are third-party graded prior to processing. The WholeTrees team finishes the timbers with a non-toxic borate treatment and natural finish to ensure longevity. We notch and fabricate the connection points creating a kit of parts for the final assembly. The kit of parts is shipped to site for its installation as a WholeTrees Solar Carport. We provide installation services nationally or can train your team with our comprehensive installation guides, included with all carport systems. Once assembled, the round timber solar carports provide clean energy and biophilic shelter for your site. Finally, the carport not only limits carbon emissions through supporting PV panels, but also through its sequestration of carbon in service. In the US, forests and forest products store enough carbon each year to offset approximately 10% of the nation’s CO2 emissions. What makes round timber solar carports different than the competition is the commitment to sustainability in structure. Concrete and steel alternatives emit large amounts of CO2 in production, which does not fit the mission of renewable energy applications working to offset high carbon energy production. WholeTrees structures work for the environment just like the PV panels they hold up. The structure alone can sequester 0.7 tons of carbon per parking space. Our product currently comes in two designs. The first is a post and beam structure designed for up to 12 parking spaces. The second is our larger commercial-scale cantilevered design that can be utilized to cover entire parking lots and bring a full forest and energy-producing canopy to your site. Solar carports are gaining traction and round timber is an ideal material for your home or office. The combination of renewable energy production supported by a renewable material makes the Pre-engineered WholeTrees Solar Carport a truly sustainable product. And just like in the forest this product allows trees to reach towards the sun just as nature intended. Full specifications can be found in our Carport Brochure and by contacting our team.